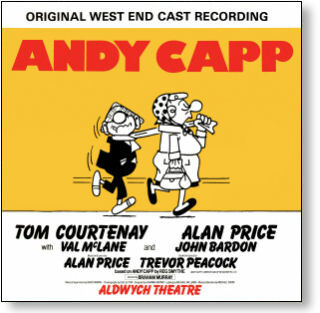 'Andy Capp' is an exuberant musical, with a delightful score by Alan Price and Trevor Peacock. The show conjures up the timeless dream world of work-shy, beer-swilling "Andy Capp", known the world over from Reg Smythe's long running cartoon strip in the Daily Mirror. The story is essentially a narrative setting an upcoming wedding (of Raquel and Elvis) against the ongoing fracas in Andy and Flo's household. The musical adaptation is a faithful evocation of the cartoon, full of mother-in-law jokes, drunken escapades, big-bosomed, mini-skirted women wielding rolling pins and paunchy, cloth-capped men stomping around in boots. 'Andy Capp' opened in June 1982 at Manchester's Royal Exchange Theatre starring Tom Courtenay as Andy, Val McLane as Flo, John Bardon as Chalkie and Alan Price as Geordie. The production transferred to London's Aldwych Theatre in September 1982 where it ran for 120 performances. 'Andy Capp' won positive reviews from the critics and was nominated for Best Musical at the 1982 Olivier Awards (then the S.W.E.T. Awards). The Original London Cast album, recorded in October 1982, makes its debut on CD and has been digitally remastered from the original master tapes. All tracks licensed from Jarrow Music.